These are my second set of wool dryer balls. The first set is from a different company and the balls are much larger which are great for our king size comforters. I like the i-gruv smaller set because it works for all of our laundry. I haven't bought a dryer sheet since we ran out. If you want a little fragrance you can use your favorite essential oil. Think lavender for your bedding, peppermint for your towels. I think you get the idea. Great natural way to dry your clothes in your clothes dryer, saving a bit of money while keeping chemicals out of your clothing. Easy to use. Four is all you need for regular loads and 6 for a large load. You can purchase the i-Gruv wool dryer balls on Amazon. What i-Gruv has to say about their product. 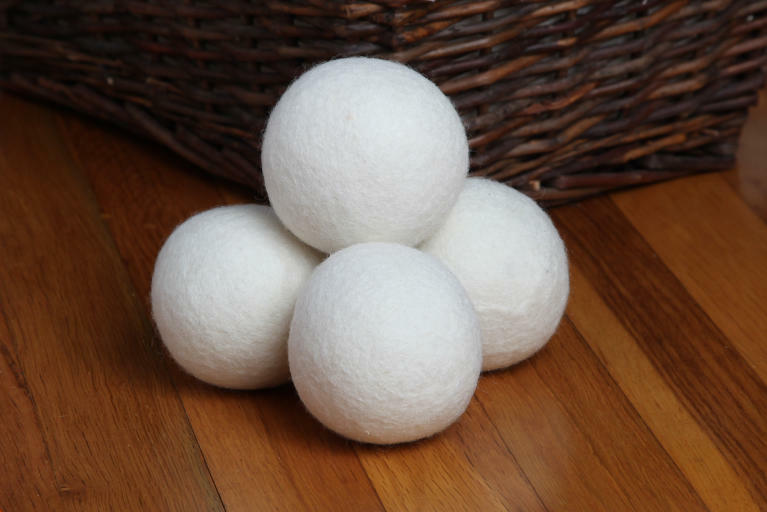 Dryer Balls for clothes dryer by i-Gruv, Hand Made with Premium Organic New Zealand Wool. Energy Saving organic Natural Fabric Softener Reduces Drying Cycle & anti static, Hypoallergenic delicate with baby clothing. Perfect for New Baby gifts set or baskets, excellent for cloth diapers. 100% NEW ZEALAND WOOL GUARANTEED. We aim to always deliver authentic product by the use of certified wool to the core. HAND MADE & HYPOALLERGENIC. These balls are made by hand in eco-friendly environments, they are safe for use on delicate skin. SAVE YOU MONEY + PAID BY THEMSELVES + MORE! Dryer Machines are expensive energy consumption, these Wool Dryer balls can be used for 1,500+ Cycles, will reduce your drying cycle by 25%-40% They will absolutely pay back. SOFTENS LAUNDRY NATURALLY & REDUCE STATIC ON YOUR CLOTHES no use of chemicals from dryer liquids or dryer sheets, excellent for those with delicate skins or babies. Static reduced will help reduce the amount of pet hair that would remain in the clothes. EXCELLENT GIFT FOR A BABY MOM: An indispensable element for drying cloth diapers and baby clothes crib sheets, give time and money back to the busy household. Disclosure: MarksvilleandMe received one or more of the products mentioned above as part of a promotion with Tomoson and i-Gruv. Regardless, MarksvilleandMe only recommends products or services we use personally and believe will be good for our readers. Some of the links in the article may be “affiliate links.” This means if you click on the link and purchase the item, I will receive compensation. If you would like MarksvilleandMe to review a product or service please contact us at marksvilleandme@gmail.com.